Crochet the chic Zelda Cloche from Interweave Crochet Spring 2014 in Madelinetosh's Tosh Sport yarn in Longwood. Crochet Brenda B. K. Anderson's fashion-forward Zelda Cloche from Interweave Crochet Spring 2014 with this exclusive kit. Hurry! We have a limited supply of kits. Order yours while supplies last. 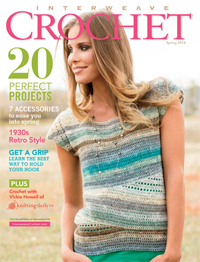 Interweave Crochet Spring 2014 features 20 projects to welcome warm weather. From scarves and wraps for the cooler end of the season to lacy tops and tunics to ease in summer, you'll find the right project to crochet. Learn the best way to hold your crochet hook, and then explore techniques from Tunisian to lacework to extended stitches. Featured in Interweave Crochet Spring 2014 is Brenda B. K. Anderson's Zelda Cloche pattern. A flower motif adorns one side of this chic cloche, and a head-snugging sideways rib on the other side makes this the perfect fit for a transitional hat. One skein of Madelinetosh Tosh Sport Yarn in Longwood. 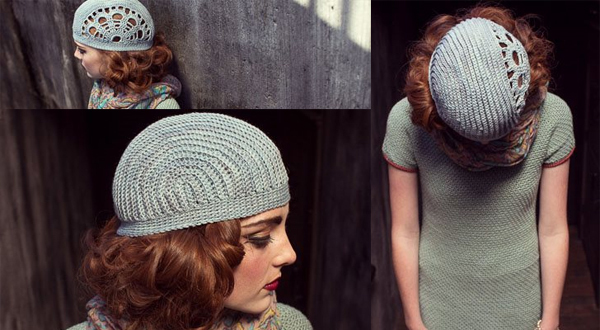 Crochet the Zelda Cloche with Madelinetosh's Tosh Sport yarn in Longwood. Tosh sport is 100% superwash merino wool. With a generous 270 yards per skein, you'll have enough yarn to crochet the Zelda Cloche even in the largest size. Each squishy, soft skein is hand-dyed in small dye lots and machine washable. We have a limited supply of each kit. Order your Zelda Cloche Kit in Longwood today, while supplies last!